NEW IRONWOOD GOURMET ORNAMENTAL SERVING TRAY ACACIA WOOD KITCHEN SERVE BREAKFAST. This is a genuine item manufactured by IRONWOOD. Serve your food and beverages to your guests or loved one in style with this stunning Ornamental Serving Tray. Beautifully crafted with love and care from sustainable Acacia wood. Generously sized with a strong frame to ensure durability. Dimensions: 36.7cm x 49cm x 4cm. Hand wash recommended in warm soapy water. The item "NEW IRONWOOD GOURMET ORNAMENTAL SERVING TRAY ACACIA WOOD KITCHEN SERVE BREAKFAST" is in sale since Monday, December 19, 2016. 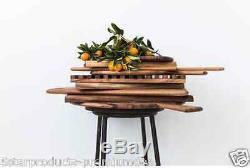 This item is in the category "Home & Garden\Kitchen, Dining, Bar\Dinnerware\Platters". The seller is "5starproducts-premiumdeals" and is located in Melbourne, VIC.